Providing a lasting memory and painting a complete picture, the Day One app provides users the ability to journal their life events in a way that celebrates and commemorates each chapter. The Aeris API Through the integration of contextual information related to each moment, Day One ensures that each event is unique and memorable. Day One is also the proud recipient of both the App of the Year and Apple Design Award as well as being one of the most popular journal apps for iOS and Mac. The HAMweather Aeris API equips Day One with a cost-effective and seamless integration of weather data that provides the current weather conditions at the particular place and time each moment was captured. It was smooth. The documentation for your service was thorough and we were able to implement it easily. Honestly, this is how it should be when using a service like HAMweather, and you didn’t disappoint. And, whenever any issues have come up, the HAMweather team has been quick to address them. All in all, HAMweather has been solid. Day One was looking for a way to enhance the user experience by capturing as much contextual information the user wanted to associate with their journal entries. Weather was one piece of context Day One identified that could provide the user a more complete scene in which each unique event or moment took place. Since weather plays a sweeping role on our health and mood, associating weather conditions with a moment in time can also set the overall tone and mood for each journal entry you can reflect on as time passes. In a seamless fashion, the Aeris API was able to implement weather data into Day One’s application. It allows users to automatically have contextual metadata such as weather, location and motion activity for their journal entries. HAMweather’s Aeris API helps paint the full picture for the user to share their life with loved ones and friends for years to come. Journal entries are geolocated by default when creating a new one. Once the user’s location has been determined, then the current weather conditions for their location are requested from the Aeris API and the interface is updated to reflect the current temperature. 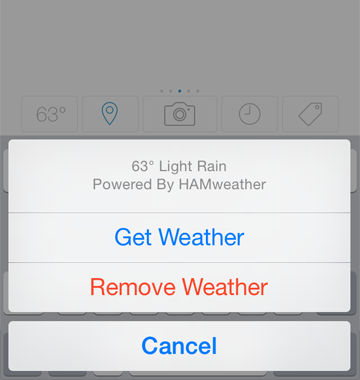 Tapping on the weather button for the entry allows the user to view the current temperature and weather for the time and place of the entry, as well as the option to update or remove the weather data. For saved entries, a brief description of the weather conditions relative to the context of the entry is displayed in conjunction with many other contextual meta data, such as location, time and current activity. The addition of weather information in Day One’s app helps people journal the experiences they want to remember in greater detail. 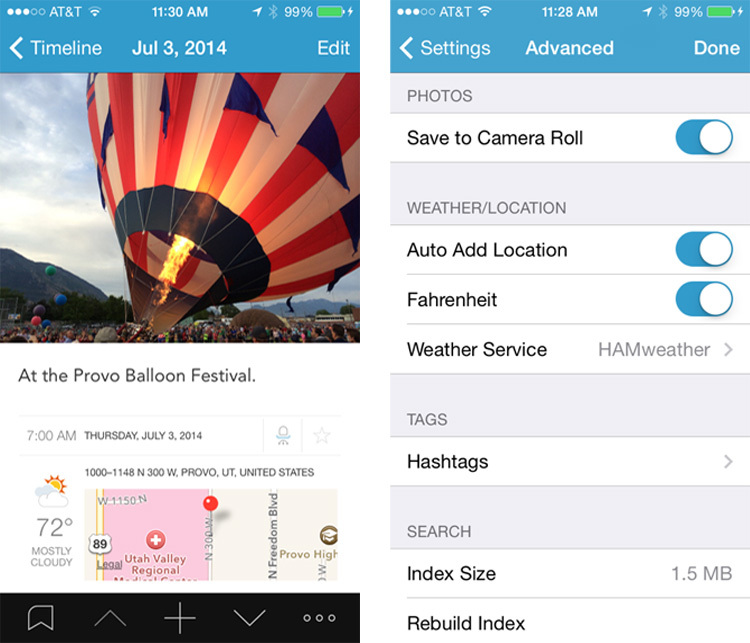 Whether you are on a stroll at the local park or traveling abroad, the Day One app along with the help of the HAMweather’s Aeris API provides users with the vivid scene and setting in which entries were written and photographed. 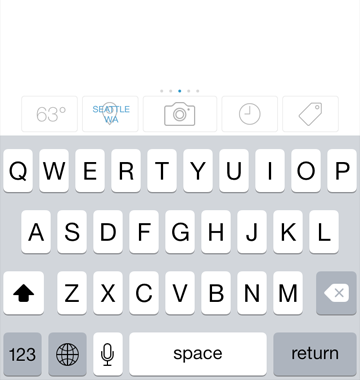 I've used other journaling apps and this is by far superior to others. I prefer the ease of locating and viewing my entries at a glance to fancy pages and fonts. 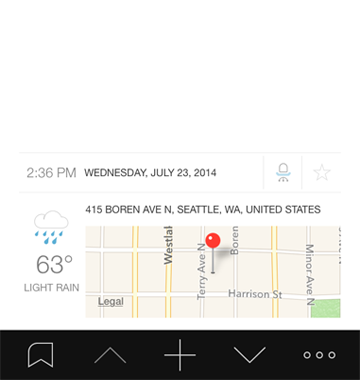 Also love the ability to add a photo, weather and location, extremely useful on vacation! From once-in-a-lifetime events to everyday moments, Day One’s elegant interface and user friendly application makes journaling your life a simple pleasure. Day One features a clear distraction free interface, modern multi-markdown writing experience, multi-device sync using iCloud or Dropbox and automatic contextual metadata for journal entries.